What is a centrifuge used for in a chemistry lab? 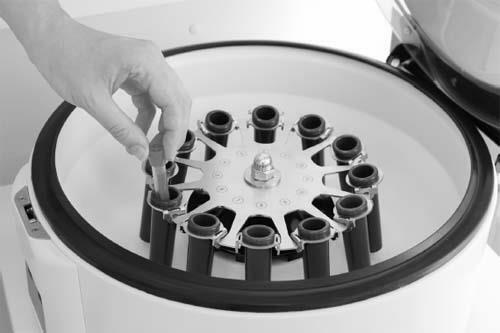 In chemistry labs, centrifuges are typically used for separating suspensions. A suspension is a heterogeneous mixture containing small solid particles suspended in a liquid. The number of applications in biochemistry and biology laboratories probably far outweighs those in pure synthetic chemistry; centrifuges are often used to separate the contents of homogenized cellular material to isolate the proteins or cellular organelles. Centrifuges have also found applications in controlling the rates of reactions by simple partitioning of reactants; a centrifuge can be used to separate enzymes from their substrates in solution, which can serve to stop or significantly slow a reaction that is already taking place. In other cases, centrifuges have been used to attempt to accelerate reactions by forcing reactants together at the bottom of the centrifuge tube. Centrifuges like this one are used to separate components in solution by spinning them rapidly, causing denser components to collect at the bottom of tubes.